Most of all, I got some new goods to play with and share. In the meantime, I have some nontraditional valentine cards I put get together. I used an embossed folder that is "wood grain" in the Big Shot, on Natural White. I put dimensionals on the piece. 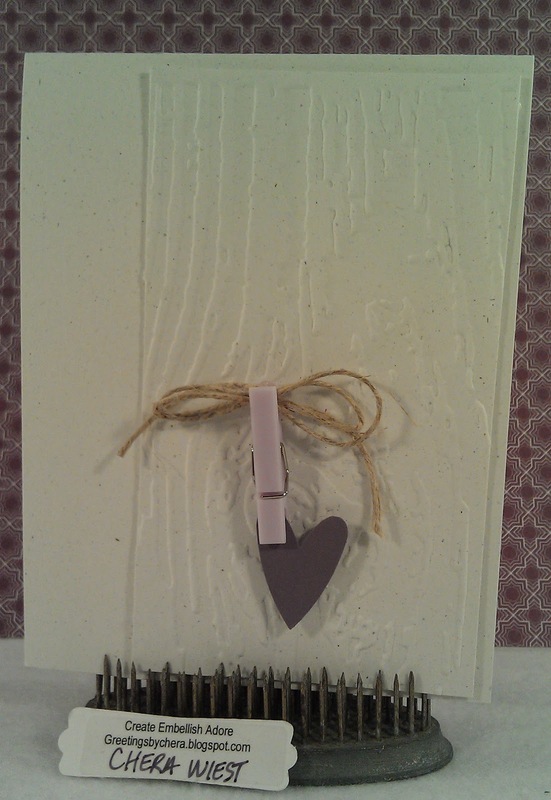 I used a very old clothes pin that I had in light purple and used the Heart to Heart punch in Perfect Plum to hang off it. I used a small bit of the hemp thread, and made a triple bow and attached it to the rear of the pin. I like the simplicity of the card. I like that it speaks volumes, even though its just three items! I am making a great attempt not show too many Valentine cards over the next few weeks. However bear with me - you never know what each day has to offer. What non-traditional colors do you like for Valentines day? I love the simplicity yet elegance of this card. Good job. 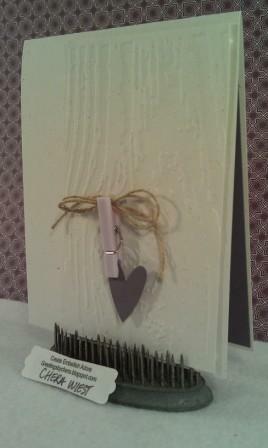 I like that embossing folder and the little clothespin is cute. I like any colors for Valentine's Day, I'm not partial to any one.